BuildingLink.com is a property management software developed to help property managers handle their operations better. It packs a myriad of solutions that include package management, communication management, resident engagement, branding and customizations, and integrations, among others. Suitable for any property, apartment complexes and high-rise buildings can configure the platform according to their needs. The dashboard, one of the software’s top features, shows you visibility and actionable insights in a quick glance about your building. You can stay on top and see the big picture of your resident information. Additionally, it streamlines visualizing maintenance requests, accessing multi-building portfolios, and highlighting package-related events. With your building and residents in mind, customize the software based on resident-specific options, lobby locations, amenity types, floors, and linens, among others. The software helps you track packages with the ImageR feature in the BuildingLink app for iOS and Android devices. This also optimizes messaging and communication between you and your residents through email, text message, and direct messaging on the app. For your system needs, the app offers KeyLink that consolidates software, hardware, and biometric authentication to ensure everyone stays informed and accountable while guaranteeing each key activity is recorded such as when service providers, employees, and authorized guests pick up and leave them. BuildingLink.com is a flexible property management system that can be customized to meet the unique needs of each property. The central dashboard is one of its notable feature that helps you search, track, and monitor operations that matters. It provides a quick glance of inventory levels, service tickets, employee performance, legal documents, resident’s preferences & requests, as well as the latest shift logs. The dashboard saves employee time, delivers key insights on buildings, and offer remarkable experience to residents. Another powerful feature is the messaging and communication module. The module provides tools that keep your employees focused on what matters most. It streamlines the flow of information between systems, departments, and shift while enabling your employee to remain focused on what matter most. Better still, the solution automatically notifies residents of guests, package delivery, outages, key pickups, and more via email, text messages, or directly on their BuildingLink App. 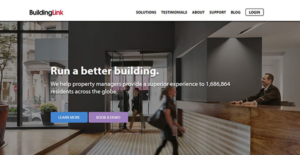 Additionally, BuildingLink.com simplifies every facet of property management including checking in guests, receiving packages, tracking maintenance requests, and viewing rental payments. It keeps you informed and empowered via the intuitive web portal and mobile apps. Also, it gives all residents the peace of mind knowing they live in a well-run building. The residential app and portal allow residents to easily access information and building services. It empowers them to interact with neighbors and sell, borrow, or buy anything on the reliable Community Bulletin Board. If you are considering BuildingLink.com it may also be sensible to examine other subcategories of Best Property Management Software gathered in our database of SaaS software reviews. Every company is different, and may call for a specific Property Management Software solution that will be fit for their company size, type of customers and employees and even individual industry they cater to. It's not wise to count on locating an ideal app that is going to work for each business no matter what their history is. It may be a good idea to read a few BuildingLink.com reviews first and even then you should keep in mind what the software is supposed to do for your company and your employees. Do you require an easy and intuitive app with only essential functions? Will you really use the complex tools needed by experts and big enterprises? Are there any specific tools that are especially practical for the industry you operate in? If you ask yourself these questions it will be much easier to get a reliable app that will match your budget. How Much Does BuildingLink.com Cost? BuildingLink.com doesn’t publicize its enterprise pricing details. Contact the vendor to obtain a custom pricing quote. We realize that when you make a decision to buy Property Management Software it’s important not only to see how experts evaluate it in their reviews, but also to find out if the real people and companies that buy it are actually satisfied with the product. That’s why we’ve created our behavior-based Customer Satisfaction Algorithm™ that gathers customer reviews, comments and BuildingLink.com reviews across a wide range of social media sites. The data is then presented in an easy to digest form showing how many people had positive and negative experience with BuildingLink.com. With that information at hand you should be equipped to make an informed buying decision that you won’t regret. What are BuildingLink.com pricing details? What integrations are available for BuildingLink.com? If you need more information about BuildingLink.com or you simply have a question let us know what you need and we’ll forward your request directly to the vendor.